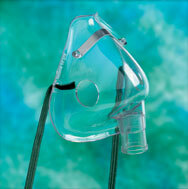 Front load mask minimizes wastage as the aerosol rides in on the patient's breath stream. Soft, comfortable fit and easy to clean. Fun for children, increases compliance. 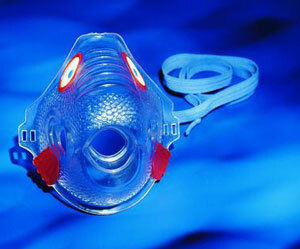 Designed specifically for use with PARI nebulizers. Economically priced to meet the needs of the managed care market. New aerodynamic shape and smaller footprint make it easy to clean and store. Convenient cord wrap built into base. Reusable inlet filter and recessed face for outlet protection. CUL listed. Operating pressure, 11-15 psi. Operating flow rate, 5.5-6 lpm. 115V with two-wire polarized flat blade plug. Height: 7". Weight: 4 lbs. 3-year limited warranty. 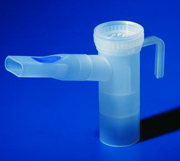 Designed for children as well as adults; uses 2 valves to maximize aerosol delivery and minimize medication wastage. Exclusive use by many top pharmaceutical companies to gain recent approval for products (AstraZenica- Pulmicort Respules; Sepracor- Xopenex™; Chiron- TOBI; Dey- AccuNeb and DuoNeb; Genentech- Pulmozyme). Works with all brands of air compressors. 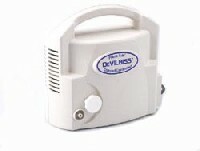 Provides fast treatments, 6.5 to 8.5 minutes (continuous nebulization, inspiratory flow 20 l/min., fill volume 2.5 ml. ; treatment times may vary with patient's age and severity of disease). No hand-lung coordination required. 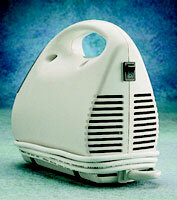 A reusable nebulizer, lasting 6 to 12 months, it can be cleaned in the dishwasher, boiled, or autoclaved. Set includes PARI LC PLUS™ Reusable Nebulizer, Tubing, Tubing Adapter, Mouthpiece and Tri-lingual instructions for use. 6-month warranty. The is our most popular design.It is very small and lightweight with features that are important to the customer 'on-the-go'.The piston compressor is very reliable, being constructed of machined aluminum parts. The sleek, new Stratos Portable Desktop aerosol compressor is small enough to fit in the palm of a hand, yet powerful enough to deliver a fast, effective aerosol treatment. It's speed, style and ease-of-use make the Stratos Portable an outstanding option for patients desiring mobility and expediency in an aerosol nebulizer/compressor unit. 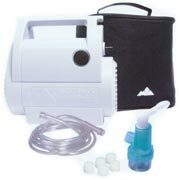 The accessory package that accompanies the Stratos Portable unit includes a high-performance, custom reusable nebulizer with mouthpiece & tubing, an AC power cord, a DC car adapter, 5 disposable replacement filters and a convenient carrying case. In addition, a custom battery pack for the Portable unit (IRC 1721) is available as a separately purchased item.